If you’re looking forward to celebrating Thanksgiving with your loved ones and sharing a banquet of mouth-watering food, you may be interested in using high quality, stylish Fiestaware in order to prepare and serve all of your family members’ favorite Thanksgiving dishes. If you enjoy making casseroles for Thanksgiving you’ll be able to purchase a casserole specific dish, which you’ll be able to pop straight into your oven. Alternatively if one of your favorite Thanksgiving foods is pumpkin pie, you’ll be able to use one of Fiestaware’s deep dish pie baker trays in order to bake the perfect Thanksgiving pie. If you have a smaller family, you may also be interested in purchasing the small pie baker, which is ideal for a family of 4 individuals. Other bakeware pieces which may prove useful in the lead up to Thanksgiving include Fiestaware’s ramekins and loaf pans. Both of which can be used for multiple purposes. If you’re sick and tired of using the same place settings for all your special occasions it’s well worth surprising your Thanksgiving guests by bringing out brand new place settings. Thankfully Fiestaware offers a wide selection of place settings all of which boast a minimum of two plates and a bowl, for several individuals. However, some place setting sets also boast a mug and extra plates, so it’s well worth choosing a bundle which suits your family’s needs. One of the reasons why Fiestaware’s place settings are always so popular is that they come in a variety of bright colors such as yellow, green and blue. After spending hours producing a juicy roast turkey, why not make your turkey the star of your Thanksgiving banquet but placing it on a Fiestaware branded extra large oval platter. Which you’ll be able to purchase in a bold Thanksgiving shade such as daffodil which is an orange-tinged yellow or tangerine, which is a bright, bold orange. If you’re looking for smaller patterns to serve the rest of your savory Thanksgiving dishes it’s also well worth considering purchasing large and medium-sized oval platters. Which are the perfect size to serve up roast vegetables, mashed potato, and sliced ham. If you assumed that Fiestaware only produced high-quality ceramic products, think again as Fiestaware also produces high-quality glasses. As an example, to brighten up your Thanksgiving table you may to consider purchasing a set of unique floral patterned glasses, which your friends and family members are bound to compliment you. If you don’t have enough matching cups to serve your guests, you may be interested in purchasing orange party cup sets. 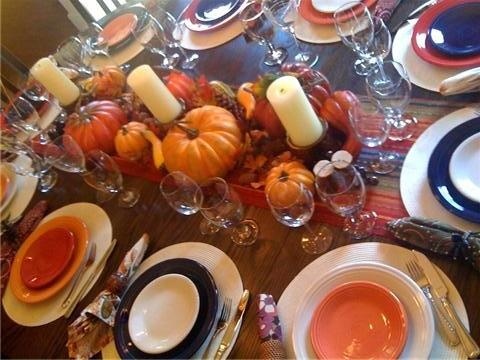 So if you want to ensure that your Thanksgiving banquet is as festive as possible, it’s well worth picking up a few high-quality Fiestaware items!